The chlorinated isocoumarin compound, ochratoxin A (OTA), together with some related derivatives (ochratoxins B, C, a, l) are produced byPenicillium verrucosumand by several spp. of Aspergillus, most notablyA. ochraceus. 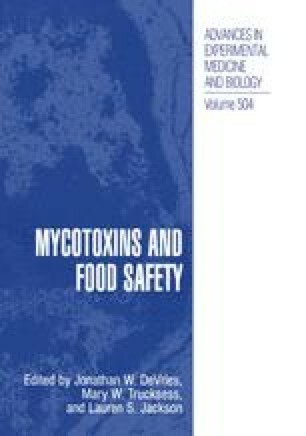 P. verrucosumis the principal source of OTA contamination of stored foods in temperate climates while Aspergillus spp. predominate in warmer countries. The major dietary sources of OTA are cereals but significant levels of contamination may be found in grape juice and red wine, coffee, cocoa, nuts, spices and dried fruits. Because of the chemical stability of OTA and long half-life in mammalian tissues, contamination may also carry over into pork and pig blood products and into beer. OTA is potently nephrotoxic and carcinogenic, the potency varying markedly between species and sexes; it is also teratogenic and immunotoxic. There have been different approaches to the risk assessment of OTA in different jurisdictions, largely arising from whether or not the carcinogenicity of OTA is considered to arise through a thresholded or non-thresholded mechanism. Consequently the tolerable intakes have variously been estimated at 100 ng/kg bw/week (JECFA), 1.5 to 5.7 ng/kg bw/day (Canada) and not more than 5 ng/kg bw/day (European Commission). These differences are also reflected in risk management measures that have been implemented or proposed with different maximum contamination levels being applied to different commodities and to the same commodity in different countries. Prevention of contamination at source is considered to be the most effective public health measure. There is also a need to harmonise the risk assessment and management processes to a greater extent than currently exist if barriers to trade are to be avoided. 1.School of Biological Sciences University of SurreyGuildfordU.K.